The wreckage of a AN-148 plane is seen in Stepanovskoye village, about 40 kilometers from the Domodedovo airport, in Russia on Sunday. MOSCOW — A Russian passenger plane believed to be carrying 71 people crashed Sunday afternoon near Moscow, shortly after takeoff from one of the city's airports. No survivors were immediately reported. The An-148 regional jet disappeared from radar screens a few minutes after departing from Domodedovo Airport en route to the city of Orsk, some 1,500 kilometres (1,000 miles) southeast of Moscow. The plane reportedly belonged to Saratov Airlines, a Russian commercial carrier. Plane fragments were found in the Ramenskoye area about 40 kilometres (25 miles) from the airport. Footage on state television showed them strewn across a snowy field with no buildings nearby. It was unclear if there were any casualties among people on the ground at the crash site. Russia's Investigative Committee said all possible crash causes were being looked into. 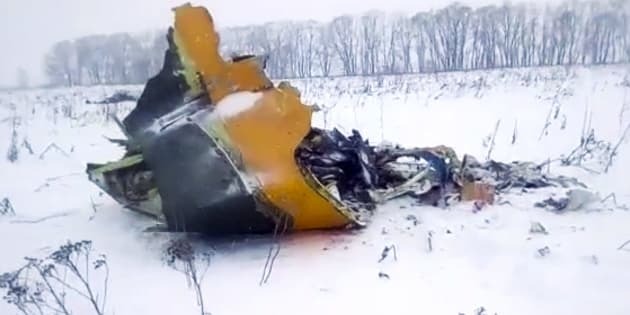 In this screen grab provided by the Life.ru, the wreckage of a AN-148 plane is seen in Stepanovskoye village, about 40 kilometers from the Domodedovo airport in Russia on Sunday.